A recent trial of Bluetooth technology in Melbournes CBD is revealing new ways to help vision-impaired people achieve greater independence in our built environment. Conducted as part of theConstruction Innovations Wayfinding in the Built Environment project, the trial used laptop computers (installed in three iHub digital information kiosks) with pre-recorded messages to automatically talk to three members of Blind Citizens Australia as they walked past wearing Bluetooth ear pieces. We wanted to prove the technology worked on a busy street in the middle of the city, and it did, said Project Leader Dennis Hogan. There are some issues to still work through, but the reaction from the blind person when the first message was received was fantastic, his face lit up and it was a very pleasant sight to see. The possibilities for such technology are considerable. It could be incorporated into buildings or public spaces to assist vision-impaired people navigate around obstacles, find lifts, toilets, exits or access information, such as opening hours and public transport timetables. The Construction Innovation project is being conducted in partnership with the Victorian Building Commission, Australian Building Codes Board, CSIRO, QUT and the Queensland Department of Public Works. 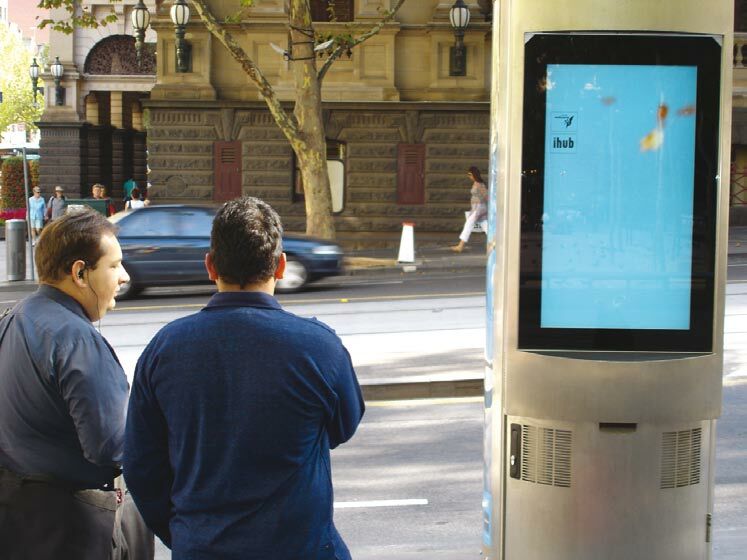 Technology for the trial was jointly created by Melbourne firm Digital Spark, which recently developed 25 iHubs for Melbournes CBD, and Clarinox Technologies. A laboratory trial on a vacant floor at Digital Spark was first conducted, before the preliminary field trial in Melbournes CBD. A further field test will be conducted in Brisbane in the coming months. The Wayfinding in the Built Environment project is a worldwide review identifying those wayfinding systems and technologies that could be used by people with a sensory impairment (particularly, a vision impairment) to find their way around buildings and large public spaces. The project will eventually make recommendations on how these technologies and systems can be incorporated into Australias building and construction practice. The Australian Building Codes Board is particularly interested in the final report outcomes for development of future amendments to the Building Code of Australia, in relation to wayfinding in the built environment. Key stakeholders from South-East Queenslands property development sector came together recently in Brisbane for a workshop to gauge industry acceptance of a proposed lot rating methodology and the impact of natural ventilation when planning for new housing developments. The workshop built on the previous CRC for Construction Innovation project Sustainable Subdivisions, which has now been extended to incorporate separate projects on ventilation and water-efficiency. Organised by Rosie Kennedy of QUTs Centre for Subtropical Design, the workshop was attended by 25 key decision makers representing developers, land development consultants, industry organisations, government and researchers. We wanted to identify the current understanding of the impact of urban form on natural ventilation, said Kennedy, and discuss the role of natural ventilation in achieving energy efficiency for dwellings. Associate Professor Glenn Thomas presented a brief analysis of a local subdivision design in terms of the influence of slope and orientation on natural ventilation potentials of residential buildings, while Dr Nur Demirbilek provided a refresher on the influence of air temperature, humidity and air movement on perceptions of thermal comfort. A hypothetical scenario put to the group stimulated discussion on key concerns, challenges and solutions regarding lot rating and natural ventilation. Based on the discussion, it seems that achieving natural ventilation is not a major concern for many in the industry, Kennedy said. However, workshops like this raise awareness and, hopefully, the ongoing work of the project will make further inroads. Construction Innovation's partners in the Sustainable Subdivisions: Ventilation project are Bovis Lend Lease, Queensland Department of Public Works, Brisbane City Council, CSIRO and QUT. The research is being led by Anne Millar of CSIRO. The original Sustainable Subdivisions research examined the link between subdivisions design in the subtropics and how characteristics of resultant lots affect energy efficiencies obtainable for dwellings built on these lots. The project examined an existing lot rating methodology and found that the methodology would need to be modified to allow for natural ventilation, to be applied appropriately for South-East Queensland.